The Windows event logs are files serving as a placeholder of all occurrences on a Windows machine. This includes logs on specific occurrence on the system, an application or the operating system. Be it an incorrect login attempt, a hack, an application failure, or a system failure- all these happenings are 'logged' here, helping troubleshoot a fault, and also monitor the system's health. All Windows events include information on the occurrence such as the event time, the source of the event, the type of fault, and a unique ID for the event type. The event logs contain a wealth of information, which helps an administrator troubleshoot and manage the system. The Event Viewer utility on the Windows device helps in viewing all the events on that machine. Why should Event Logs be monitored? Periodic backup of your network data is the first step for disaster recovery. Assume you have an application like Veritas doing the backup job for you. Ensuring a smooth backup is a critical task, specially, in environments where you hold important customer data. It needs little imagination to say what will happen if the backup fails and you end up finding it out only the next morning! The objective of enabling a firewall for security, goes for a toss when the firewall service goes down or is unwilling to start and you discover hours later! Of all things, no administrator would like to fail in safeguarding the network. A quick warning over an SMS or email, or a popup on your machine for the ISA firewall failure will save a lot of time. Monitoring specific event logs like with the ID 11000 will solve this problem. An event log is the first call for help! Naturally, as an administrator, the responsibility of watching out for the help calls lies with you and you need to choose and put in place a proper solution to track the important events. Both the above situations could have been avoided, or at least, mended in time by monitoring the event logs 57751, 34113 for the backup failures. Though the Windows Event Viewer gives an exhaustive account of the events, the problem however is the lack of a centralized view of these events across machines. Moreover, a huge number of event logs are 'information' events and can be conveniently ignored. Automating the monitoring of important event logs is the next logical step and therefore calls for an effective monitoring tool. That said; let us see how OpManager helps you achieve this in addition to monitoring all other network resources. We understand the importance of simplified, centralized monitoring. There can be nothing cooler than an application intelligently filtering important event logs and notifying it periodically. This apart from monitoring the devices, applications, and other hardware resources! OpManager provides a set of about 50 pre-defined event log rules. 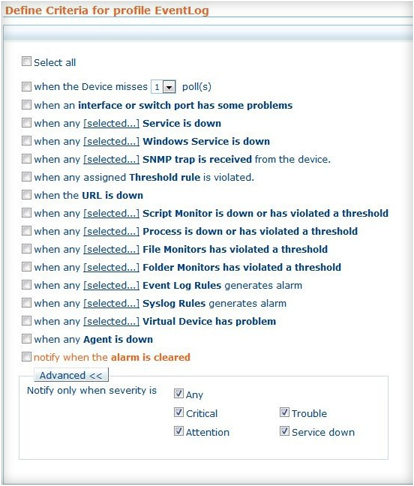 Besides, you can configure as many rules as required to address your event log monitoring need and assign appropriate severity. The default rules can be modified or removed too. Based on the rules, the event logs are converted into OpManager alarms and you can be notified also using an email or sms. The ability to define rules based on any or all of the windows event log properties is of sure plus! OpManager acts as the guardian angel for your network by keeping a watch on the important event logs of the entire Windows environment as discussed above. For instance, a user who is restricted access to specific machines is trying to access a network drive on one of the machines, a cause for security concern. A failure audit event is triggered in the event logs and you will see the event listed in the Security event log category. With just a few clicks, you will be able to configure this Failure audit event log monitoring for all your windows machines. When there is a security event of this nature, OpManager generates a corresponding meaningful alarm and also notifies immediately over SMS or email. It is highly impossible for an administrator to keep a watch for a security breach on each and every machine's event logs. Life is easier when he can view all the problems from a single console. And this is possible if OpManager is deployed in this network. Often, securing the network from internal user becomes a daunting task. Users restricted from accessing critical servers try logging in. Hackers at times meddle with the audit service so that the login attempts are not traced. Security events are logged for all these. Any application failure raises an event. Highly critical services like Active Directory, and its related services, failure of critical services startup like that of ISA, more than the allowed number of users trying to access an application, insufficient system resources for an application to run etc require round-the-clock monitoring. All these are critical to business and will prove costly if unattended. You will find event logs for all these. The health of a system needs to be good to serve important applications. Any system failure needs monitoring. It can be a bad disk, attempt by a user to replace a system file. Again, the first clue to the failure comes from the event logs. Active Directory depends extensively on the DNS service availability. Needless to say that it needs monitoring. 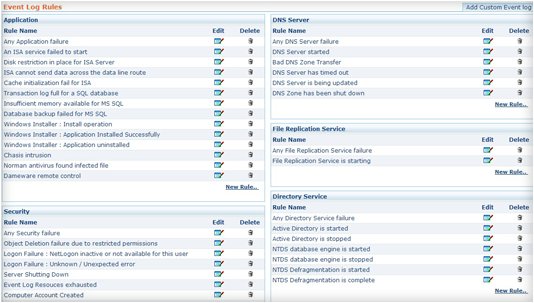 The Domain Controllers have a specific category to log the system events specific to DNS. This service is responsible for replicating data across the Domain Controllers. Failure of this service leads to critical issues such as logon. This too, therefore needs monitoring. Like DNS, a separate category is provided for FRS too for quicker troubleshooting. OpManager is a comprehensive monitoring solution monitoring all resources on your network and comes with extensive windows event logs monitoring capabilities. Managing event logs centrally cannot be easier!! Stop by at our support portal for any queries.